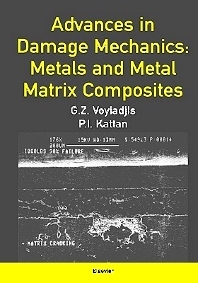 This book provides in a single and unified volume a clear and thorough presentation of the recent advances in continuum damage mechanics for metals and metal matrix composites. Emphasis is placed on the theoretical formulation of the different constitutive models in this area, but sections are added to demonstrate the applications of the theory. In addition, some sections contain new material that has not appeared before in the literature. The book is divided into three major parts: Part I deals with the scalar formulation and is limited to the analysis of isotropic damage in materials; Parts II and III deal with the tensor formulation and is applied to general states of deformation and damage. The material appearing in this text is limited to plastic deformation and damage in ductile materials (e.g. metals and metal matrix composites) but excludes many of the recent advances made in creep, brittle fracture, and temperature effects since the authors feel that these topics require a separate volume for this presentation. Furthermore, the applications presented in this book are the simplest possible ones and are mainly based on the uniaxial tension test. For researchers and graduate students in civil engineering, mechanical engineering, engineering mechanics and materials science. Part and chapter headings: Introduction. Part I: Isotropic Damage Mechanics - Scalar Formulation. Uniaxial Tension in Metals. Uniaxial Tension in Elastic Metal Matrix Composites. Uniaxial Tension in Elasto-Plastic Metal Matrix Composites: Vector Formulation of the Overall Approach. Part II: Anisotropic Damage Mechanics - Tensor Formulation. Damage and Elasticity in Metals. Damage and Plasticity in Metals. Metal Matrix Composites - Overall Approach. Metal Matrix Composites - Local Approach. Equivalence of the Overall and Local Approaches. Metal Matrix Composites - Local and Interfacial Damage. Symmetrization of the Effective Stress Tensor. Experimental Damage Investigation. High Cyclic Fatigue Damage for Uni-Directional Metal Matrix Composites. Anisotropic Cyclic Damage-Plasticity Models for Metal Matrix Composites. Part III: Advanced Topics in Damage Mechanics. Damage in Metal Matrix Composites Using the Generalized Cells Method. The Kinematics of Damage for Finite-Strain Elasto-Plastic Solids. A Coupled Anisotropic Damage Model for the Inelastic Response of Composite Materials. References. Appendices: Listing of Damage Formulas. Subject index.